The booklet came out in May, but because of the May elections we have only just got round to doing a public launch. Over the Bank holiday weekend two Japanese visitors came to meet members of Hebden Bridge Walkers action and members to Tod Walkers. Professor Yuko Shioji from the Dept of International Tourism, Hannan University came with Professor Tatsuya Suzuki, Vice Director, Satoyama Research centre Kyoto. Yuko is researching footpaths and social and cultural recreation around footpaths. Suzuki is particularly interested in the law in relation to land access and footpaths. Earlier in the month four of them came to England, visiting the Walkers are Welcome towns of Ross on Wye, Chepstow and Winchcombe. 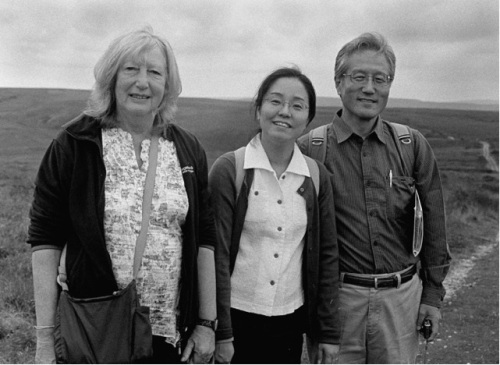 Professors Keiji Maegawa and Yukari Kubo returned to spend a short time in London before they all flew home, but Yuko and Suzuki headed north because they were anxious to see the first Walkers are Welcome town and the first long distance footpath in England. Suzy Hesselden, one of our members, met them and took them around areas of interest in Hebden. They stayed at Laurel End Guest house where Laura, the landlady gave them a great welcome. The following day they spent the morning in Todmorden with Tod walkers learning about the imminent establishment of Todmorden as a Walkers are Welcome town. They also looked at the Incredible Edible project sites. After lunch at Mo Ludlam’s house with several HBWA members they were taken on to the moors to look at Access land and hear from Bruce Cutts, Natural England about the ongoing project, mapping access to England’s coastline. They also learnt about the CROWS act 2000 (Countryside and Rights of Way Act) whereby the public were finally able to gain access to Open country in England. On Monday, Ian Vickridge our Vice Chair and Bob Deacon took them on the Hebden Bridge Loop on the Pennine Way. They were both really pleased to see and experience part of the Pennine Way, the first long distance footpath in England, and talk about the development of the Loop path that opened in April 2015. In Japan they are anxious to encourage the development of footpaths and walking routes to regenerate the rural economy. Most of the population of Japan now live in urban areas whilst the country areas decay. Both Yuko and Suzuki see their experiences in England relevant to their research in Japan and the development of more footpaths there. Lets hope their visit will encourage other Japanese visitors to come to Hebden. Lots seem to go to Howarth but rarely seem to venture over the hill. Our new booklet – Howarth to Hebden Bridge and Back might help too. Once again the Rotary Club of Hebden Bridge is organising the Wadsworth Parish Boundary Walk on Sunday 31st May. As usual, they will be raising money for local charities and good causes. Full details of their recent charitable donations and how to enter can be found on their website. A group in Todmorden has set up Todwalkers to promote walking in the town. They are currently working on a seies of walks from buses and later in the year will be considering promoting Todmorden as a Walkers are Welcome town. They have a website which is being populated at present. Work has started on the upgrades for the loop and half the waymarking has been completed. We will be distributing a leaflet about the launch on April 25th at our meeting on March 10th. The main promotion leaflet will be distributed to accommodation providers up and down the Pennine Way by the end of March. There is already a good presence on the web. more details on the Pennine Way page. From 23rd – 27th May 16 people are canoeing down the river Thames over 5 days to raise money in aid of Calder Valley Search and Rescue team. The challenge is equivalent to a marathon a day for 5 days. Raise money for the Hospice by taking part in our 3 mile walk around Ogden Waters. Sunday 22nd March, meeting at the Ogden classroom. Register before the day for a reduce price. Adults £3.50 under 16’s £1.50. Also on the same day is the Overgate Hospice Teddy Toddle, a family walk around the reservoir with your favorite teddy bear. A family walk in aid of Overgate Hospice. Face painters, teddy bear quiz, refreshments and Baby Ballet bear Twinkle. Join us on Sunday 22th March any time 10:30am – 12:30pm for a stroll around Ogden Reservoir with your favorite teddy bear. Adults £3.50 and under 16’s £1.50 before the day registration. Also on the same day is our 3 mile Ogden stomp. Meet at the Ogden classroom. 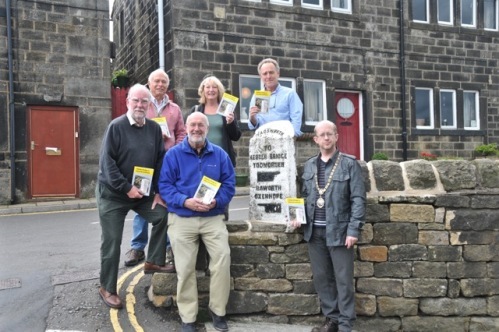 Hebden Bridge Walkers Action with Hebden Bridge Hostel plan to bring the Pennine Way to Hebden Bridge and Heptonstall on Aprl 25th its 50th anniversary. More details about what’s involved and progress are on our Pennine Way page.